Tomorrow, October 21, is the gala for the 2012 Canadian Children's Book Centre Awards. I've reviewed all the nominees for the Marilyn Baillie Picture Book Award, as well as the picture book nominee for the Norma Fleck Award for Children's Nonfiction. So I am excited to see who wins! 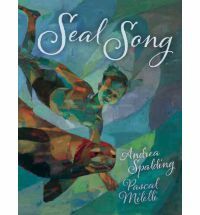 There is one English picture book nominated for the main TD Canadian Children’s Literature Award, Seal Song. Usually these are for meatier books aimed at older audiences, with mainly text. But Seal Song holds its own among the other books. This book reads like a finely honed oral tradition that has been passed down for hundreds of years, getting better with each re-telling. It is a delicate balance of prose and poetry that really grabs the reader. Finn helps his fisherman father with his work, but makes time to make friends with the selkie seals around them. When a unique young girl comes to town, Finn makes fast friends with her too. The fishermen know what he doesn't, that she is a seal girl whose songs bring good luck but who cannot touch the salt water without having to go back to the ocean. Finn's friend Sheila makes the sacrifice of her human body to save Finn and his father from an ocean storm. Milelli's illustrations reflect the sea and refracted light of the sun on every page. Coupled with Spalding's masterful storytelling, this art proves that picture books can be as deep and moving as any other book. Find out tomorrow if the CCBC judges agree. This is the twenty-fifth book I have reviewed for the Sixth Canadian Book Challenge.